The “Combat Paper” show at Burlington’s Firehouse Gallery has a raw, ritualistic quality that makes the experience of it both unsettling and therapeutic — perhaps even more for its creators than for the viewers. The handmade paper artworks are, after all, crafted from shredded and pulverized U.S. military uniforms. 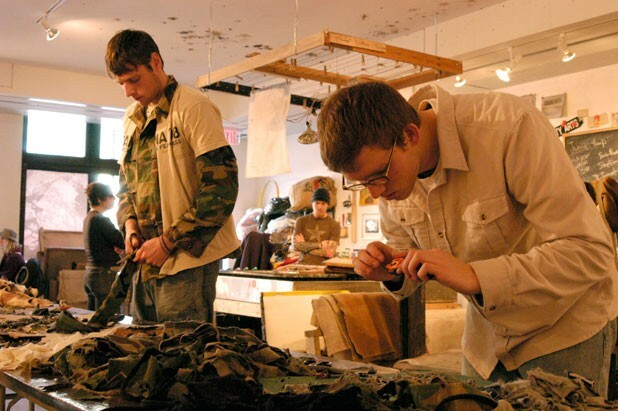 They were once worn in Iraq by the now-antiwar artist/vets who launched the Combat Paper Project on returning home. That rawness was on display at the exhibit’s opening on February 20, when Jon Turner stomped and screamed his way through poetry expressive of the rage he and other veterans brought back from Iraq. Anguish is also evident in some of the 20 or so works hung on the walls. Especially fierce is Eli Wright’s “Open Wound,” in which streaks and splatters of red surround a jagged hole torn from blackened paper. Drew Cameron, a member of Iraq Veterans Against the War, explains that he cofounded the Combat Paper Project in 2004 with fellow vet Drew Matott as a way of promoting “dignity, reconciliation and healing.” The collaborators have toured the country, transforming war gear into art material and seeking to discourage high school students from enlisting in the military. “We’re reclaiming horrible experiences and turning them into something beautiful,” Cameron says. But in the view of some vets — especially older ones — the Combat Paper Project is actually staging disrespectful spectacles similar to flag burnings. Vermonters who served in one or another of America’s wars over the past 70 years have stopped by the Firehouse out of curiosity about, or solidarity with, the project, Cameron says. A few active-duty soldiers from Fort Drum in upstate New York have dropped in as well. But no one currently stationed at Camp Johnson in Colchester has seen the show, as far as Cameron knows. Visitors are welcome to participate as well as peruse. A papermaking studio set up in the gallery offers an opportunity to cut up camouflage fatigues that are then immersed in water and spun through a pulping machine. Confettied currency purchased from the United States Mint for $18 per pound is added to the beater, along with shards of cotton to give the pulp a green hue and thick texture. Papermaking is an ancient process developed millennia ago in China, notes Cameron, who learned it from his father, a retired U.S. Air Force officer. The rending of garments taking place at the Firehouse associates this particular process with the biblical ritual of mourning. Jolene Herzog is thinking of friends she lost to the Vietnam War when she and her 10-year-old son, Russ, take part in the papermaking as Mardi Gras revelers gather on Church Street. “They didn’t actually die in Vietnam,” Herzog explains. “They died here because of what happened to them there. They didn’t go as heroin addicts, but that’s how they came back. 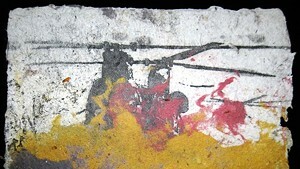 “Combat Paper” is on view at the Firehouse Gallery in Burlington through April 11. Info, 865-7165.